Lee Bradbury is setting his sights on another Hawks home win as they welcome Folkestone Invicta to Westleigh Park tomorrow (3pm). His side got their Ryman Premier League campaign up and running with a confident 3-1 win over Leatherhead on Tuesday night. It was the perfect antidote following a disappointing 3-1 opening-day defeat at Leiston. And Bradbury appreciated the importance of the first win in helping the belief flood back into his squad. ‘It was important for us to get up and running and I thought we played well,’ he said. ‘We must make sure we maintain the same energy levels and belief in the way we play. ‘Getting the first win takes that little bit of pressure off and we have a chance to build on it with another home game. ‘I am looking for us to show the same commitment and desire that brought us our win. ‘In this league we cannot afford to take anything for granted just because we have come down from a higher league. ‘We have to make sure we stick to our standards week in, week out. The visitors will arrive boasting a 100-per-cent win record, including an excellent victory at highly-fancied Staines Town in the week. After the defeat at Leiston, Bradbury decided to change his strikers and felt the introduction of Jason Prior and Alfie Rutherford paid dividends. The pair scored 70 goals between them for Bognor last season in the Ryman Premier. 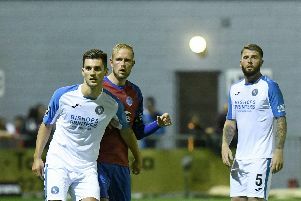 Prior opened his Hawks account with a thumping second-half header, and Rutherford proved a handful for the visiting defenders. The Hawks will also take great encouragement from the introduction of Wes Fogden as a second-half substitute for his first appearance. Fogden returned to the club from League Two outfit Yeovil Town during the summer following an injury-hit season. The ex-Pompey man was involved in the action straight away and capped his performance with a good goal. ‘I thought he was going to score with his first touch,’ said Bradbury. Wide player George Barker has missed the opening two games with a hamstring strain and is a doubt for tomorrow.